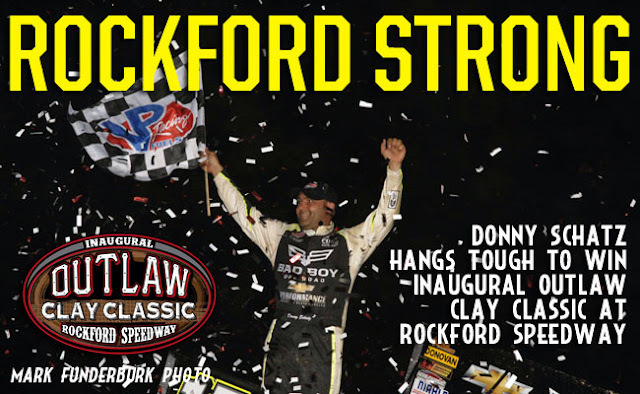 ROCKFORD, Ill. - June 29, 2016 - As the World of Outlaws Craftsman® Sprint Car Series feature field rounded the final lap of the inaugural Outlaw Clay Classic at Rockford Speedway on Wednesday night, Donny Schatz looked poised to win. But David Gravel was charging and as Schatz rounded the final turns, maneuvering through traffic, Gravel dove low as Schatz hugged the cushion. Side-by-side off the corner, Schatz edged Gravel to score his 11th win of the season. The history-making victory as the sprint cars kicked off the Outlaw Clay Classic on the normally-paved quarter-mile oval was the 215th victory of Schatz's career. "Catching someone on that is one thing - getting by them is completely different," Schatz said of Gravel catching him in the final laps. "I don't know if I had a tire going down… but I started getting tight and rolled up and just couldn't turn the corner… we at least got the win." Parker Price-Miller kicked off the special event by taking the qualifying quick time with a lap of 11.806 seconds. It was the first World of Outlaws quick time for Price-Miller and set the dirt record at the 69-year-old Rockford Speedway which was covered in eight inches of Illinois river clay - the first time the track has ever had dirt on it. Challenging track conditions set up an especially tough 30-lap inaugural feature for the Outlaws. Schatz led the field to the green with Daryn Pittman, Gravel and Ian Madsen behind. Schatz opened up a strong lead through the first 10 laps, catching the tail end of the field by lap three. NASCAR standout and two-time series winner Christopher Bell brought out the first caution of the night. While battling Shane Stewart he got caught in the cushion and ended up on his side. As the field returned to green Schatz again extended his lead as Madsen tried to get around Gravel for third. One more caution flag flew on lap 16 which bunched the field back up. Madsen and Gravel recommenced their battle but Gravel pulled away. Taking an aggressive line through a rough turns one and two, Gravel began challenging Pittman in second. Back and forth they battled until Pittman was knocked off kilter through turns one and two. Pittman faded following as Shane Stewart battled past Brad Sweet for third. With second in his grip Gravel looked to Schatz in the lead. On the second-to-last lap, Schatz got caught up in traffic and Gravel closed the gap. He challenged hard on the closing lap, but Schatz hung on to win. "It's typically not the type of race track that we're good on but these guys go to work and try to make me as comfortable as they can. I was in the air, sideways, doing wheelies. Some laps I didn't know if I was going to come out the other end. It was a crapshoot." Schatz rolls out of Rockford with an 86-point lead over Sweet in the championship standings. "I had a shot," Gravel said of his last lap battle with Schatz. "When you enter the corner high and chop down low, you get a really good run down the straightaway and I just tried to poke my nose. Just happy to finish second." Shane Stewart, who has five wins on the season, notched his 14th podium finish with a strong run from an eighth-place starting position. After Pittman and Madsen struggled late, Stewart took advantage. "On nights like this you've got to be patient and hopefully some of the guys mess up in front of you and you can take advantage of that and we were able to do that. A podium finish is a great night for us starting eighth. We'll carry this into the weekend and hopefully we can pick up another win." The World of Outlaws Craftsman Sprint Car Series rolls south for the Fourth of July weekend to Badlands Motor Speedway on Saturday, July 2 and Sunday, July 3. For more information and to learn how to purchase tickets, visit WoOSprint.com/Badlands-Motor-Speedway. RACE NOTES: Donny Schatz picked up his 11th World of Outlaws Craftsman Sprint Car Series victory of the season and 215th career win tonight at Rockford Speedway… Jason Johnson was the night's KSE Racing Hard Charger, advancing 10 positions to finish in sixth… Schatz extended his points lead over Brad Sweet to 86… Parker Price-Miller scored his first ever World of Outlaws quick time with a lap of 11.806 seconds. In the track's first ever dirt event, Price-Miller becomes the dirt record holder at the track. SEASON WINNERS: Donny Schatz - 11 (Volusia Speedway Park on Feb. 14, The Dirt Track at Las Vegas on March 4, Stockton Dirt Track on March 18, Stockton Dirt Track on March 19, Silver Dollar Speedway on April 2, Lincoln Speedway on May 19, Weedsport Speedway on May 22, Lincoln Park Speedway on June 8, Knoxville Raceway on June 11, River Cities Speedway on June 17, Rockford Speedway on June 29); Brad Sweet - 6 (Volusia Speedway Park on Feb. 13, Volusia Speedway Park on Feb. 14, Cotton Bowl Speedway on Feb. 26, Ocean Speedway on April 1, Bakersfield Speedway on April 15, Plymouth Speedway on May 13); Daryn Pittman - 5 (Royal Purple Raceway on Feb. 27, Perris Auto Speedway on April 16, USA Raceway on April 18, New Egypt Speedway on May 24, Jackson Motorplex on June 24); Shane Stewart - 5 (Arizona Speedway on March 6, Devil's Bowl Speedway on April 23, Lawrenceburg Speedway on May 30, Granite City Speedway on June 15, Brown County Speedway on June 19); Joey Saldana - 4 (The Dirt Track at Las Vegas on March 3, Devil's Bowl Speedway on April 22, Jacksonville Speedway on May 4, I-80 Speedway on June 22); David Gravel - 3 (Thunderbowl Raceway on March 12, Tri-State Speedway on May 14, I-96 Speedway on June 6); Kerry Madsen - 2 (Eldora Speedway on May 6 and 7);Bill Balog - 1 (Beaver Dam Raceway on June 25); Lance Dewease - 1 (Williams Grove Speedway on May 20);Chad Kemenah - 1 (Fremont Speedway on June 3); Jason Johnson - 1 (Placerville Speedway on March 24);Terry McCarl - 1 (Knoxville Raceway on June 10); Jason Sides - 1 (I-30 Speedway on April 26); Greg Wilson - 1 (The Dirt Track at Charlotte on May 27). World of Outlaws Craftsman® Sprint Car Series Statistical Report; Rockford Speedway; Rockford, Ill..; June 29, 2016.